But, I still try to do some leisure reading on Sundays. 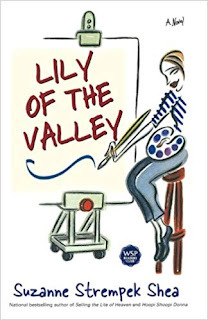 The past couple weekends, I reread Lily of the Valley by Suzanne Strempek Shea. I enjoy Shea's early work. She is from the same general area (The Pioneer Valley in Western Massachusetts) that I live in and it is fun to read about places that I recognize. Her early novels were from the 1990s and feature Polish Catholics. They capture a particular time and place so well, freezing those moments, that they now read like historical fiction, albeit of a not-too-distant past. Lily of the Valley tells of Lily Wilk, an artist who makes her living painting whatever anyone commissions her to do: fire hydrants, store signs, bathroom doors, etc. But when local supermarket mogul Mary Ziemba hires her to paint a family portrait, she thinks her ship has finally come in. While things don't turn out quite as she hoped, she learns a great deal in the process about what truly makes a family. Live a Year full of Holy Moments!